I remember once in high school seeing a girl pulling a makeup bag as big as her head out of her bag & re-apply every scrap of makeup she was wearing...right on top of what she was already wearing. I have always been someone who applies makeup in the morning & doesn't really look at it again until I decide to take it off. I sometime put more effort in when I am wearing a red lip but basically I am very, very lazy. It's the illusion of makeup that I need not the actual coverage. So it's pretty obvious that I've never had a handbag makeup bag before. In fact the last time I had a makeup bag was about three months after I discovered YouTube makeup tutorials, then my makeup collection out grew my makeup bag & started to cover my desk. 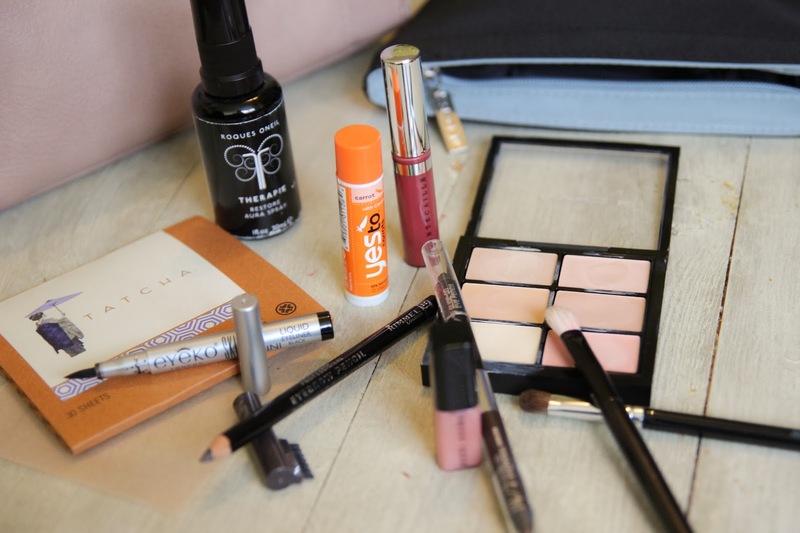 First of all, this isn't a totally artificial collection of products, some of these products have been rattling around the bottom of my bag - the blotting papers, lipgloss & facial spray fall into that category. The rest are things that I've been thinking about moving to my handbag but just never bothered to transfer...I mentioned that I'm super lazy right? As far as the rest of the products go, I've got a sample of the Eyeko Skinny Liner, a double ended Urban Decay 24/7 Glide-On Eye Pencil in Perversion (my favourite black eyeliner) & Demolition (my favourite brown), a yes to carrots lip butter in carrot, two eyeshadow brushes (a mini Space N.K. one & a No7 Eyeshadow Blend & Contour Brush) &, possibly most importantly, a Mac Pro Conceal & Correct Palette in Light. 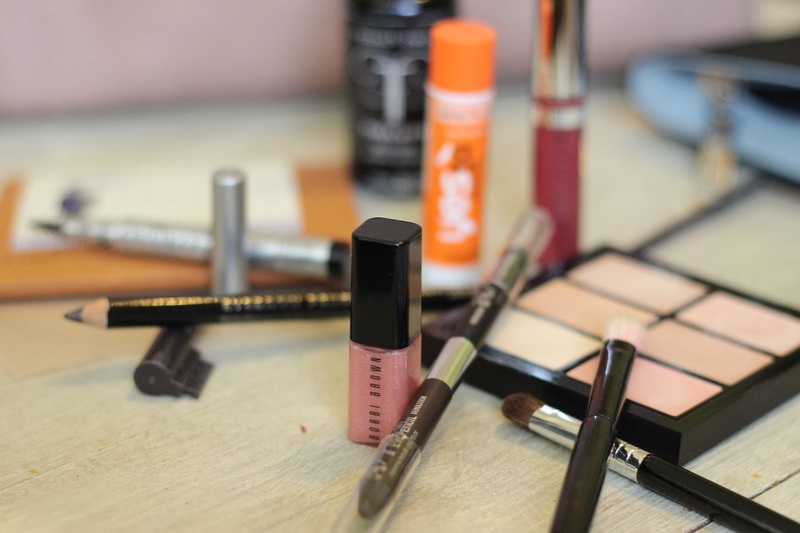 What do you have in your makeup bags? 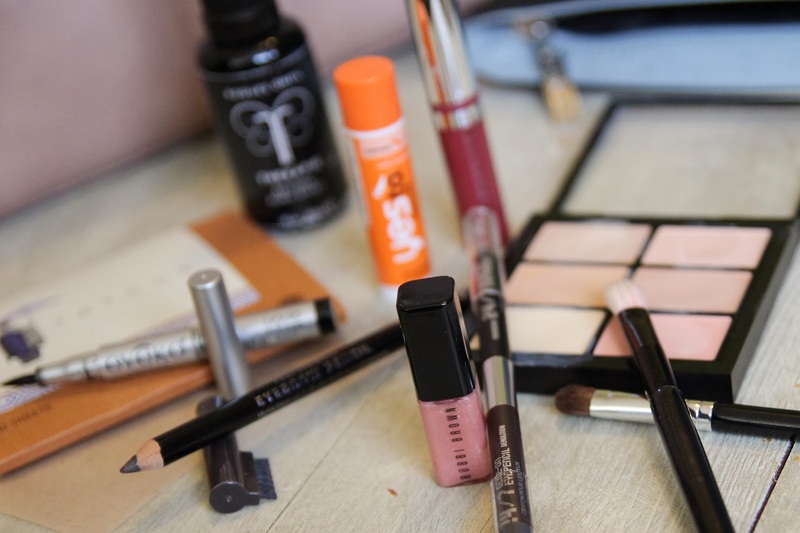 Any products I should have in my handbag that I'm missing? That lip gloss looks so pretty! I think you've got everything covered. Do you carry a hand lotion as well? I don't put it in my makeup bag, but I have got to have some with me at all times! I also have a concealer in my makeup bag. Great post!